Here’s Robin’s advice on how to manage this sticky-but-common problem. Enjoy! And if you have any questions, be sure to hop into the Cooking Support group on Facebook, where you can get your cooking questions answered on the fly. Poor timing might just be the story of my life; I’m famous for not being on time. Not that I’m always late. In fact, often it’s the opposite. Yes, I am that guest who shows up to the party while you’re still in your ratty housecleaning clothes. I arrive 30 minutes before the meeting is scheduled to begin and I spend 20 minutes listening to podcasts in my car while I wait for my son to get out of school. But I’m just as likely to overstay my welcome, dash into the meeting late with my shirt on inside out, or forget to pick my son up altogether. With cooking, it’s no different. The meal is ready half an hour before the guests arrive and by the time we sit down to eat, everything is cold and/or soggy. Or it’s not ready until 10 pm when everyone is too tired to eat. Worse, one part of the meal might be ready right on time, but somehow a crucial element needs to cook for another 15 minutes. Over the years, I have picked up a few tips and tricks to nail the timing of a good meal, but I’ll be honest: the struggle is real. 1. Stick with what you know. I’m not saying don’t experiment with new dishes, but rather, only experiment with one new dish at a time. In addition to being famous for always being early, I’m also famous for always making entire meals I’ve never cooked before for dinner parties… and for having meltdowns right before my guests arrive. Believe me, this doesn’t help one bit with my timing issues. Before you give even one single thought to what dishes you’ll serve, get a firm grasp on how much time you have to cook. Say you want to eat at 6:30, and you get home from work at 5:30. You know you have a maximum of one hour to work within. You obviously don’t have time for a braise that spends 2 hours in the oven. A quick Pork Stir Fry with Green Onions sounds totally doable, but check to make sure meats don’t need to marinate ahead of time and/or how many veggies need to be chopped before you begin cooking. Tips for Cooking Whole Grains may need to be started the minute you get home if they’re to be ready when the rest of the meal is. A note on ingredient prep: Chopping veggies takes time. For some people, it can take a lot of time. Think carefully about how long it’s going to take you to get everything chopped and ready to go, then make sure to account for that time in your cooking schedule. If you have 60 minutes before you want to serve dinner, the dish takes 45 minutes to cook, and it takes you another 45 minutes to chop all the vegetables… well, you do the math. 3. Share the love between oven, stove, etc. Organization is important, just like when you’re learning how to work with the cooking zones in your kitchen to keep sane while cooking. When choosing your menu, don’t forget to consider the cooking methods you’ll be using. If you only have one oven (or even if you have two!) it’s simply not possible to cook a How Long to Roast a Chicken!, roasted vegetables, fresh-baked bread, and a layer cake all at the same time. a dish (or two) that is served cold, raw, or that can be fully prepped and cooked well in advance (if you have that luxury). This will prevent you from having to wait for one item to finish before starting another, which is the kiss of death when it comes to timing dinner. 4. Menu planning, part II. Some dishes require more precise timing than others. There are foods that are happy to sit and wait to be served, while others need to be served immediately, lest they pitch a hissy fit when made to wait. Here are some examples. A roast needs to rest for at least 10 or 15 minutes after it comes out of the oven, tented with foil. It can sit a little longer, if necessary. Most casseroles will hold up just fine in a warm oven for a few extra minutes. Hearty veggies and root vegetables can wait in a warm oven without much fuss. Just before serving, give them a quick toss in their pan to brighten them up. If fluffed with a fork once or twice to keep them from compacting, grains will also keep for a few extra minutes. Or use a rice cooker with a “warm” setting to hold them. Delicate cooked vegetables will wilt, become dry, or develop a greasy sheen. They’re best prepared at the last minute. Many sauces tend to congeal or break when left to sit, so make them towards the end and don’t pour them over your food until serving time. Salads begin to wilt as soon as you dress them, so add your How to Make Salad Dressing just before serving. Fried foods, crispy-skinned chicken, or anything you want to be crunchy should be served as quickly as possible, so make sure everything else is ready to go before you drop those fritters into the fryer. If you start by cooking the dishes that don’t mind waiting, then finish up with the foods that refuse to wait, you’ll find that your entire dinner is at its peak when you serve it. This tip is my favorite, because it eliminates so much mealtime stress. Prep ahead! Do as much as you can an hour, a day, or even a week ahead of time. Meats become tender and infused with flavor if you marinate them a day or so in advance. Stews, soups, and chilis are often even better the day after they’re made, so you can cook those in advance and simply heat on the stovetop just before serving. Salads can be fully prepped—veggies washed and cut, dressing blended, nuts toasted, cheese crumbled or grated—well in advance with just a little last-minute plating magic required. Don’t dress the salad until you serve it! Frozen desserts can last in the freezer for weeks, and even baked desserts can usually be made well ahead of time. Assembled [but undecorated] cakes freeze beautifully, ready to be frosted the day you serve them. 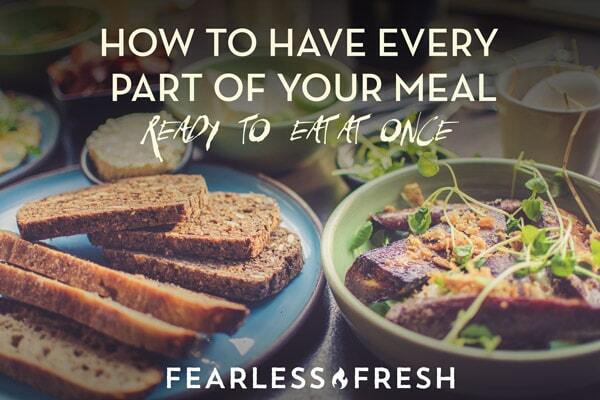 As with so many things in life, a well-timed meal is all about planning and preparation. Now if I could just stick that fashionably late party arrival, I’d be just about set. 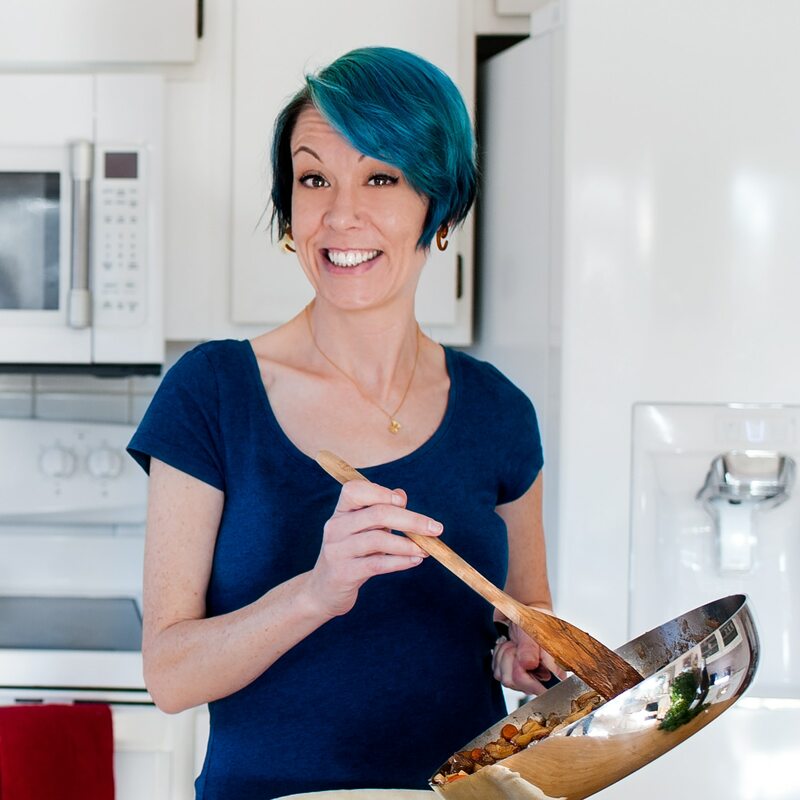 Robin is a food writer, cookbook author, and recipe developer who is obsessed with creating easy recipes for delicious dishes. She has written dozens of cookbooks including the bestselling Campfire Cuisine: Gourmet Recipes for the Great Outdoors and The Deceptively Easy Dessert Cookbook. Read her food blog, All Ways Delicious.